Rainbow Springs State Park is a fantastic adventure in two parts. Drive your car to the South entrance and park. There you will find a concession stand, restrooms, tube rentals, and shuttle buses. Pay for your trip here. Then you board the bus which takes you and your tube to the North Put In Ramp. Down the short walkway you can launch off of the ramp into Rainbow Springs. Don't forget your waterproof camera! 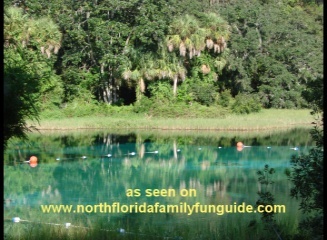 Lush tropical forest is on one side, and beautiful Rainbow River Estates are on the other side with crystal clear springs below you carrying you South to the Pull Out Ramp. We saw turtles, cormorants, aninghas, herons, and even a vulture that freaked us out as it walked along the side, following us! When we got out of the river, we walked a short way right back to the parking lot where we parked. Very Convenient! We camped right there at Rainbow Springs State Park. The amenities there are tops! There is a playground, covered pavilion right next to it, a large gift shop/ camp store, and a newly re-opened swimming pool!! Electricity, water, and fire pits on each site. The second part of the Rainbow Springs Adventure is swimming at the Main Head Springs. This is a separate park down the road on 41, just 3 miles away. This park is gorgeous! Really expansive with rolling waterfalls, gardens and the most beautiful swimming area ever. Just look at the pictures! Canoeing and kayaking, picnicking, and swimming are very popular here. The park is very large and plenty of room for large groups to visit and have a group get together. Very nice place! It's easy to find Rainbow Springs, just head West on 40 , past Ocala, till it ends! By the way, if you are there and are hungry, try this place called Pizza Q's right near the Head Springs entrance. Their pizza was awesome, and we went back and got barbeque sandwiches for dinner, it was very good! Special Mother's Day and Father's Day Price: Only $1 admission! Wonderful picnic area, and fantastic kayaking experience. Highly recommend!